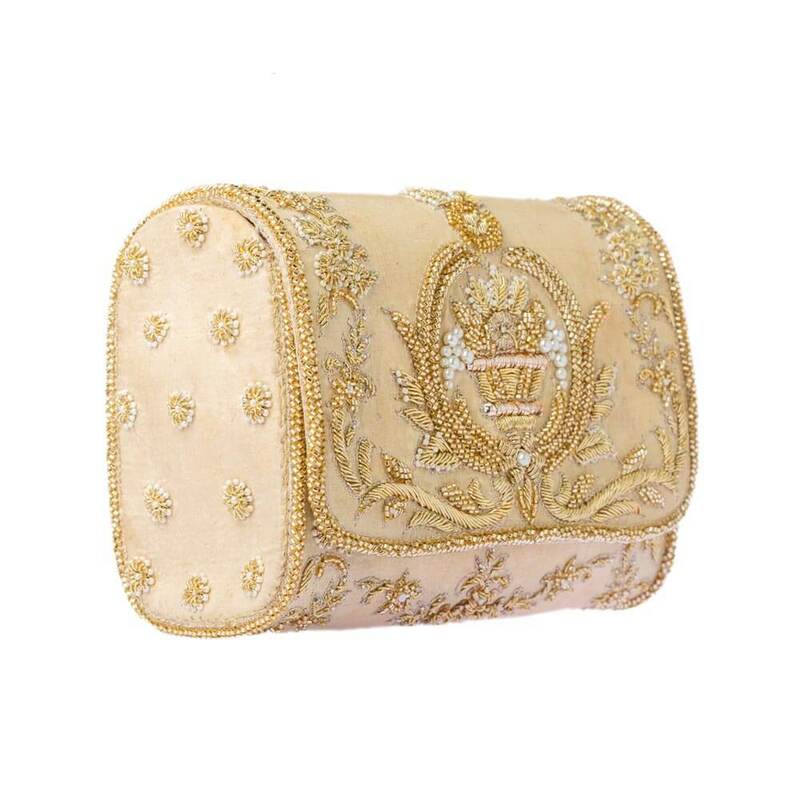 DESCRIPTION: Japanese beads and fine dabka Zardosi hand embroidered pure velvet/silk clutch with a chain handle. Size: 14x11m. Collection: Celebratio. Color: Olive Green. Care: Store in dust bag. Keep away from moisture. 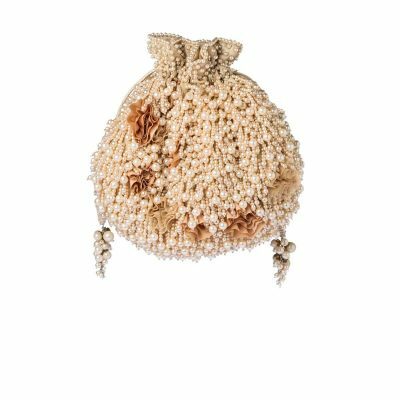 This is a delicately hand embroidered japanese beads soft flapver clutch with a long chain handle. COLOR: Rose Gold. CARE: Store in dust bag. Keep away from moisture. DIMENSION: 16 cm x 12 cm x 6.5 cm. 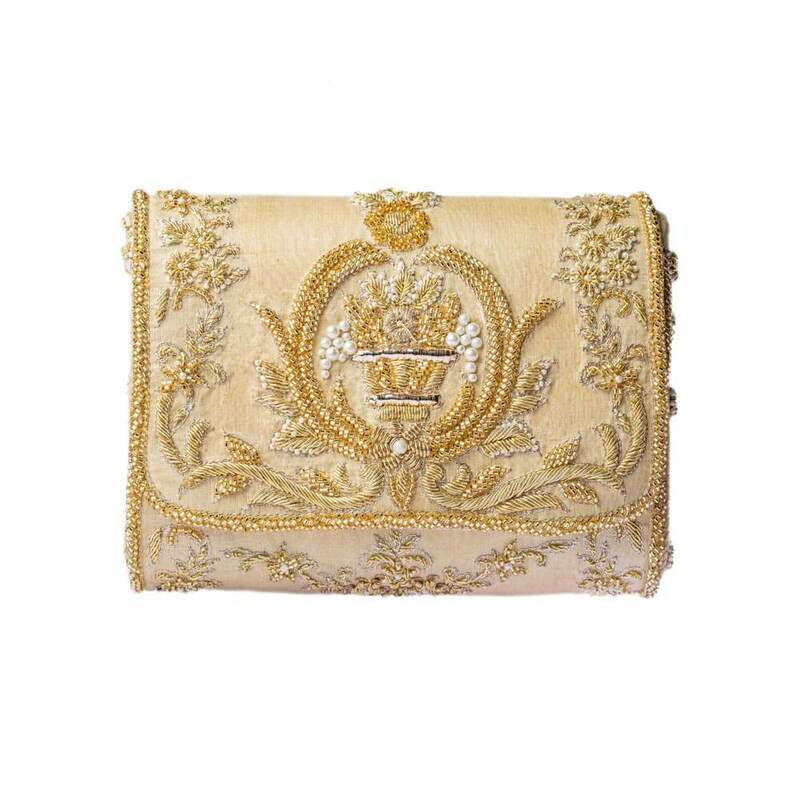 Delicate glass beads and pearls zardosi hand embroidered clutch with chain handle. Size: 17 x 11 cm. Collection: Celebration. Color: Silver. Care : Store in a dust bag. Keep away from moisture. 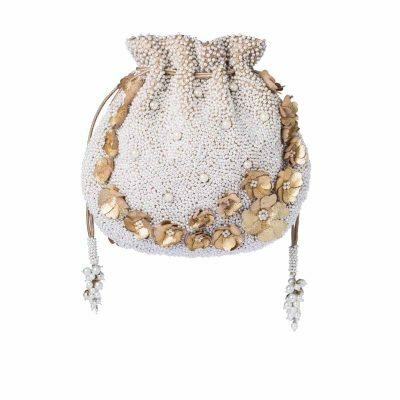 Delicate pearls hand-embroidered pouch with pure leather flowers wristlet and long chain handle. Size: 17x8cm. Collection: Celebratio. Color: Champagne. Care: Store in dust bag. Keep away from moisture. Delicate japanese glass beads, hand embroidered flapover clutch with chain handle. Size: 14x11cm. Collection: Celebratio. Color: Silver. Care: Store in dust bag. Keep away from moisture. Delicate Japanese glass beads hand embroidered pouch with a wrist and long chain handle. Size: 23x20cm. Collection: Celebratio. Color: Silver. Care: Store in dust bag. Keep away from moisture. Delicate Japanese glass beads hand embroidered pouch with chain handle. Size: 22.5x13.5cm. Collection: Celebratio. Color: Gold. Care: Store in dust bag. Keep away from moisture. 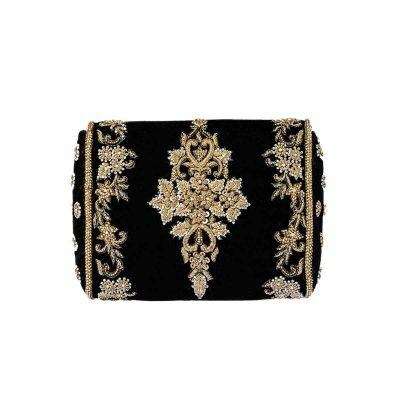 Japanese beads and fine dabka Zardosi hand embroidered pure velvet/silk clutch with a chain handle. Size: 14x11cm. Collection: Celebratio. Color: Black. Care: Store in dust bag. Keep away from moisture. 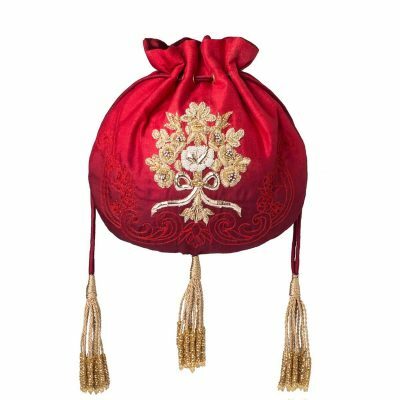 Japanese beads and fine dabka Zardosi hand embroidered pure velvet/silk box clutch with a metal concho , dimante clasp, chain handle and tassel at the bottom. Size: 22x12cm. Collection: Celebratio. Color: Wine. Care: Store in dust bag. Keep away from moisture. Delicate glass beads and pearls zardosi hand embroidered clutch with chain handle. Care : Store in dust bag. Keep away from moisture. 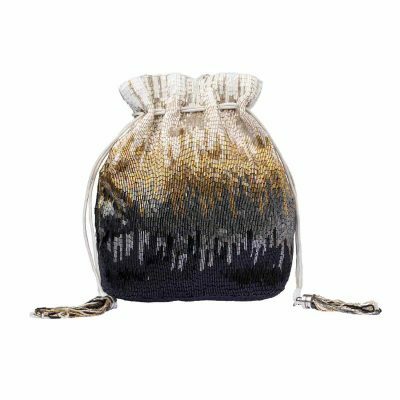 Delicate japanese glass beads, hand embroidered pouch bag with chain handle. Size: 25x16cm. Collection: Celebratio. Color: Gold. Care: Store in dust bag. Keep away from moisture. Delicate japanese glass beads hand embroidered pouch with chain handle. Size: 22.5x13.5cm. Collection: Celebratio. Color: Silver. Care: Store in dust bag. Keep away from moisture. Delicate pearls hand embroidered pouch with pure leather flowers, wristlet and long chain handle. Size: 24x22cm. Collection: Celebratio. Color: Ivory. Care: Store in dust bag. Keep away from moisture. 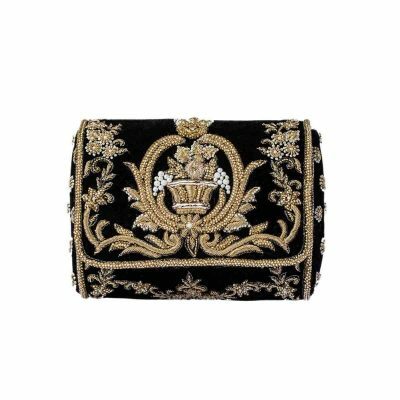 Japanese beads and fine dabka Zardosi hand embroidered pure velvet/silk box clutch with a metal concho, dimante clasp and chain handle. Size: 18x12cm. Collection: Celebratio. Color: Blus Pink. Care: Store in dust bag. Keep away from moisture. Delicate japanese glass beads, hand embroidered pouch bag with chain handle. Size: 25x16cm. Collection: Celebratio. Color: Silver. Care: Store in dust bag. Keep away from moisture. Delicate japanese glass beads, hand embroidered flapover clutch with chain handle. Size: 14x11cm. Collection: Celebratio. Color: Black. Care: Store in dust bag. Keep away from moisture. Delicate japanese glass beads hand embroidered pouch with chain handle. Size: 22.5x13.5cm. Collection: Celebratio. 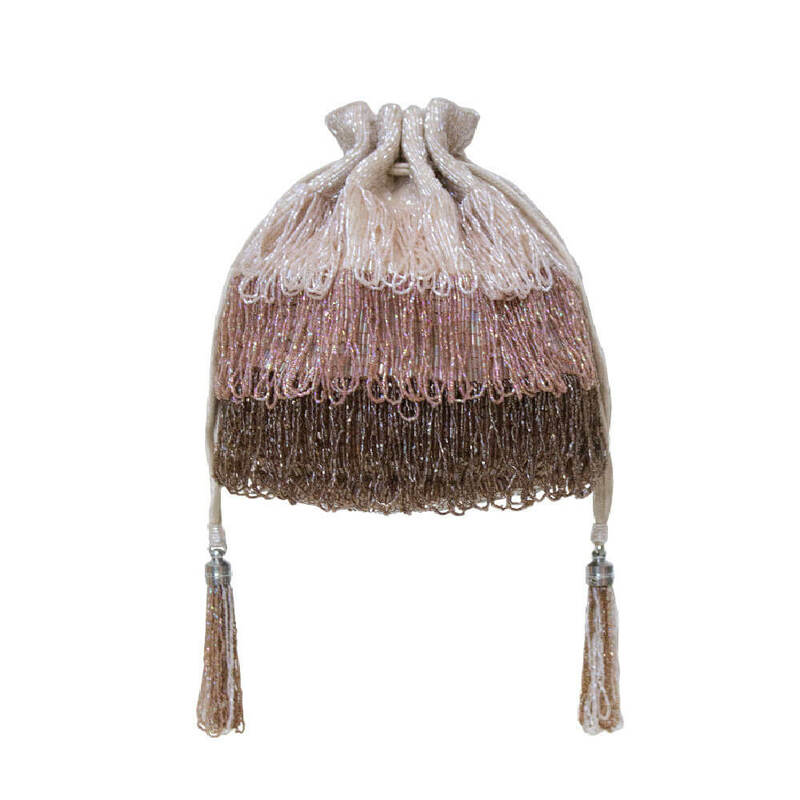 Color: Blush Pink. Care: Store in dust bag. Keep away from moisture. 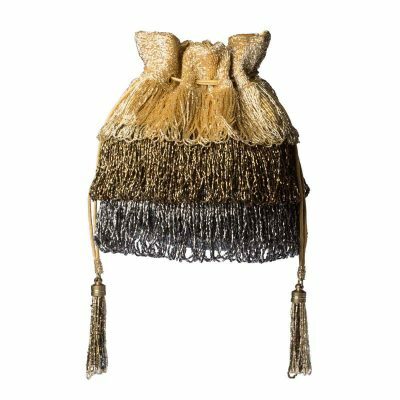 Japanese beads and fine dabka Zardosi hand embroidered ombre silk pouch with a bottom tassel, wristlet and long chain handle. Size: 22x19cm. Collection: Celebratio. Color: Crimson Red. Care: Store in dust bag. Keep away from moisture.